After the first Earth Summit, Lenore Taylor’s headline was ‘Actions Must Now Match Words, Says UN Official’. Twenty years later, that headline could easily be recycled. We have not taken the actions that world leaders had waxed so eloquently on back then. 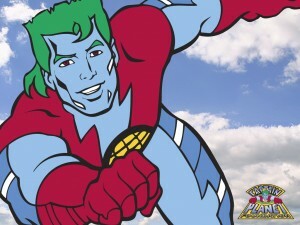 The ‘Captain Planet’ generation grew up hopeful that the world would stop environmental destruction before it was too late. After twenty years of believing that our voices mattered, we become cynical. And after this week, we’re angry. More than 45,000 participants in Rio+20 are returning to their lives without having witnessed any major change to international environmental law or the rules of the global economy. Many of us are asking how we got into a situation where Governments are failing to act in the best interests of the majority of their people. The deal that eventuated from months of negotiations was so watered down that every single press release from civil society shared a common message: this was rubbish. Governments have been presented with the evidence about what’s happening to our planet. If they have any respect for science, they know how serious it is. This month’s alarming Nature paper, ‘Approaching a state shift in Earth’s biosphere’ is the scientific equivalent of shouting from the rooftops. And by now, the solutions are just as understood as the problem. We know what’s causing the damage: pollution, carbon dioxide emissions, overfishing, deforestation, overconsumption, overpopulation and a growth-driven global economic system. And if we caused the problem, we have the ability to solve it. Changing the world’s development model to one that respects planetary boundaries won’t be easy, but it’s not as if we don’t know how to do it. So if world leaders know what’s wrong, and we have the tools to fix things, what the hell happened in Rio? And Copenhagen, for that matter? And Durban, Cancun, Poznan, Bali and Montreal? Why do these environmental mega-summits keep failing? The blame doesn’t lie entirely with the government negotiators. Coming out of Rio, there’s a much bigger story to tell than short-sighted leaders. Halfway through the summit, I snuck into a business lunch. As fate would have it, the table sat down at was populated with representatives of the mining industry. They were from an international peak body for mining companies, and were there for the same reason they attend every international meeting – to lobby. Chewing their steak, the mining guys told me they were pleased with the negotiations so far. It was the same day that Brazil had presented a new, watered-down text that environment and aid groups had denounced as an ‘epic failure’. Other business leaders with a more long-term perspective weren’t so happy. In a different side event across the hall from where the lunch was held, a panel of entrepreneurs from clean tech start-ups and eco-innovative companies were speaking at the Rio+social conference. ‘Screw business as usual,’ said one of them, and the audience cheered. We haven’t moved forward in tackling the challenges of sustainable development and climate change for a simple reason. The people whose lives are at risk from environmental collapse are less politically powerful than the people whose profits are at risk from the solutions. Australians know the power polluting industries have and how ruthless they are in using it. We’ve seen it firsthand. The mining industry alone spent $22 million on its advertising campaign to protect its super profits against the mining tax, helping to topple former prime minister Kevin Rudd in the process. In the United States, the sums are even bigger. The Centre for Responsive Politics have calculated that individuals and political action committees affiliated with oil and gas companies have donated $238.7 million to candidates and parties since the 1990 election cycle (75 percent of which has gone to Republicans). And according to Greenpeace, there are four full time lobbyists paid by the fossil fuel industry swarming around Capitol Hill for every U.S. congressman or congresswoman. It’s working. Oil Change International estimates that fossil-fuel companies get $59 back in subsidies for every dollar they spend on donations and lobbying in the States. In Australia, ACF estimates that fossil fuel companies receive $12.1 billion in subsidies and tax breaks. “In Australia, taxpayers are handing over $4,480 every minute to fossil fuel companies paying for their fuel excise alone,” said the ACF’s Simon O’Connor. She’s right. But paradigm shifts don’t happen on their own. Coming out of Rio, it’s clear that corporate influence is polluting our democracy. It’s become so bad that Governments can’t see clearly through the smog. We all have a responsibility to change this situation. Past generations made sacrifices for the sake of their children. This is the first generation sarificing their children for the sake of themselves – and most people know in their hearts it can’t end well. In the wake of Rio, it’s time for ordinary people to speak up. Governments will only aim as high as their citizens demand. You don’t need anything other than what you have to make a difference. You have a voice. Now use it. Cross-posted with permission from Anna Rose. This entry was posted in Climate change and tagged change, climate, future, rio20 by Anna Rose. Bookmark the permalink. Anna Rose is an Australian writer, activist and environmentalist. She is co-founder and Chair of the Australian Youth Climate Coalition and is a former Environment Minister’s joint Young Environmentalist of the Year.